For the most part I enjoy the different heights in the game, and have made plenty of use out of Laura’s Height Chart. My dilemma has been height, how tall do I make Lewis, and are the McCarthy’s all tall? Cause that wouldn’t genetically make sense. Now that I’ve gotten the SimDna cheat to work, I’ve finally been able to implement height through DNA. So now I don’t have to guess how tall Alice will grow up to be, which is tall like her grandpa, Randy London. I have a sick love for genetics and Punnett Squares, I think Gregor Mendel was genius, and I’ve been known to draw out Punnett Squares just for the heck of it. I plotted out my future children, and found that with our specific genes, my brown eyes are recessive paired with my husbands green, due to our parent’s genes. I decided I wanted 3 height rankings: short, average, tall. I decided to keep it simple, and am linking height to eye color. In the photo below, we have George who is 5’10” which makes him average, and Mandy who is 5’7″ which makes her tall in my charts above. Whoever has George’s eye color will be average and Mandy’s will be tall. This allows someone who gains their grandpa’s eye color, to also gain their height. You can see that Hazel and Finn are both tall for men and women based on receiving their mom’s eye color. Finn is tall at 5’11” and his wife, Nicole is average at 5’6″. Most of their children are average, as they have Nicole’s eye color, but Julius, Elias, and Emma are all tall. Poor Oliver, he’ll be passed by his younger brothers in a few years. Paloma has her father’s eyes and will be tall for a woman when she grows up, while her grandmother, mother, and little sister are all average. Meg, Peter, and Lauren Schehl will all be short as adults. Dean and Lewis both have their late mother, Brynn’s eyes, so they are going to be average. While Morgan and Zeke are both tall, as such their future child(ren) will more than likely be tall. So there’s how I linked heights to genetics in my game, and took out the question of how tall I should make a sim. Which was always shamefully stressful for me. Wow! That’s great! I’m totally going to have to try that now! I’m glad your dilemma has been solved! You, my dear, are nothing short of a genius! I will be shamelessly stealing this! I’ve been looking for a way to decide height genetically and I’ve sort of been doing it but there’s a little too much decision making required of me and I sort of like to leave things up to chance. This will work quite well for that, I think. Tessa, I’m glad my dilemma has been solved too! It’s been bugging me for far too long! Carla, steal away. 🙂 I was seriously SO pleased to see that Alice had her grandpa’s eye color, and therefore would be tall (the rest of her family is average), and to see recessive genes kick in, is just awesome! 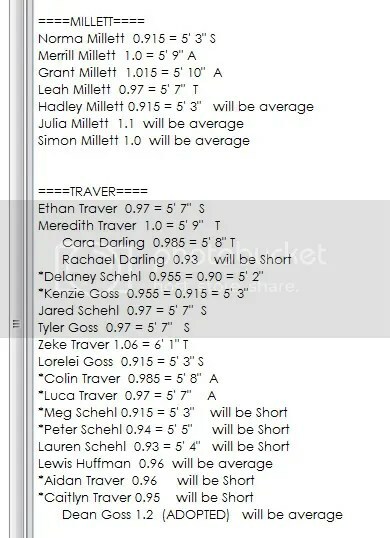 I like having the variance in each group as well, it lets me decide if they are a short-average or a tall-average, etc. which gives me some freedom. I hope it works great in your hood! Very nice way to link height to genetics. Question-in the case that a child pulls an eye color from prior generations, will that child have the height of that ancestor then? I’ve been wanting to implement heights in LaQuest Beach and this is just the thing to make me get it in gear! Jennifer well get to it! 😉 The heights add such a touch of realism, that I can’t imagine not playing with them now. They are my favorite in the school age kids, when they all line up in their classes or on the playground, there’s a real diversity. That’s really interesting! I like seeing how other people try to expand the inherited traits in the game. I’ve also tried to implement inherited heights in my game, but I’ve done so with a simple formula based on the parents’ heights. I love this idea and I’m trying to figure out how to make it work since I use SO many eyes. How did you decided which height would be linked to a certain eyes? Do you use more than 5 eyes colors? 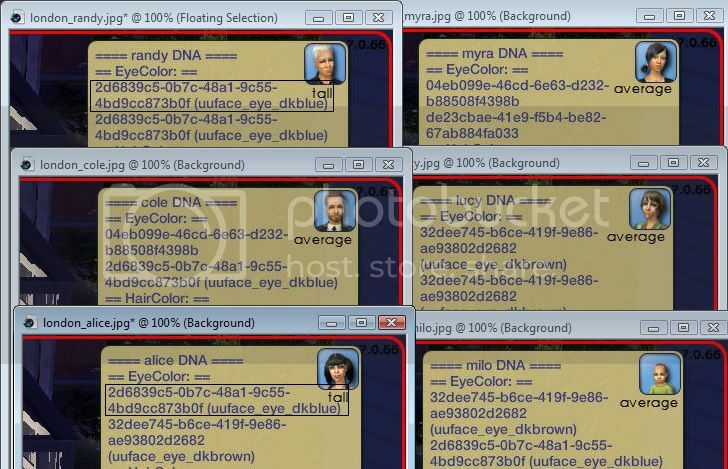 I have loads of custom eye colors, my heights aren’t tied to the actual eye color for the entire population. It’s *only* tied to a height (tall/short/average) within a specific family. Bob Smith has blue, and is tall, his son has blue and is tall. Xin Cho has blue and is short, and her daughter has blue, and is also short. In the beginning I had to decide how tall or short the grandparents were, and work my way down by who has their eyes or not. I’ve rolled for townies that are in relationships/friendships with mine. It wasn’t too difficult to start, with say, Randy London, and going down his lineage, because I already had an idea for his height after all these years playing. Thanks and that does make sense. It’s also tons easier than what I was thinking. I’ll have to give this some more thought. This is really good! Before I read this I was just rollind die to see who was tall, who was short, and who was avrage. Again, that’s so much!